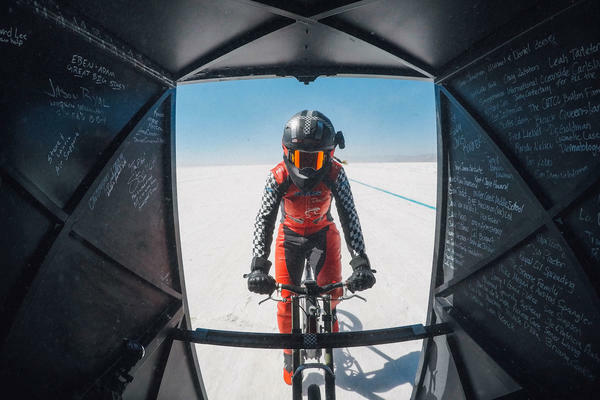 Denise Mueller-Korenek rode a custom bike at an average of 183.932 miles per hour — shattering a world record that had stood since 1995. The dragster has fairing on the back that essentially looks like a closet, to protect the cyclist from the wind. Behind it, Mueller-Korenek sat on a bike with gearing so steep that she needed to be towed to about 100 mph before taking over under her own power. Once they finished that phase of the run, the danger of a calamitous fall wasn't over: Holbrook and Mueller-Korenek had to work in tandem to slow down some 70 mph over a final mile to reach an exit speed of 110 mph. The feat may cause Guinness World Records to change its categories, which currently separate bicycle speed records by gender. Mueller-Korenek and Holbrook obliterated that record this weekend with a gripping ride during the World of Speed event held at the Salt Flats. Celebrating the successful record attempt, Holbrook shouted: "Where's our margarita? We have the salt." Moments after the run, the news that she had obliterated the land speed record for a paced cyclist drew a stunned response from Mueller-Korenek, who also noted that it was a higher speed than they were supposed to aim for. "Oh, shoot," she said in her son's video. "We weren't supposed to go more than 175. Well, we aren't going to be let back out, probably."